From left: older versions of Dash, Violet, and Jack-Jack. All images used with permission. Disney’s The Incredibles series might be about a happy-go-lucky superhero family balancing superhero work, school crushes, and diaper changes, but that doesn’t mean they’re going to stay that way. Comics artist Warrick Wong has created an art series dedicated to his vision of the Parr family’s future, and it’s pretty damn intense. Wong has released artistic depictions of members of the Parr family in the future, starting with teenage Jack-Jack and going all the way through “Old Man Incredible.” The images have been making the rounds online, with fans loving his interpretation of the characters and their story—even if it takes a beloved children’s film and makes it ultra depressing. But that’s cool: Disney is no stranger to letting their beloved characters suffer. Isn’t that right, half of the universe in Avengers: Infinity War? “I was really surprised at how well received these drawings were. I thought I was going to get a lot of raised eyebrows, but the reaction was quite the contrary. Everyone seemed to actually love this idea of the older kids,” Wong told io9. An adult Violet emerges as the leader of the Parr family. Wong said he envisions Dash’s speed abilities increasing to The Flash levels, possibly leading to time travel. An older Jack-Jack harnessing his three most-popular abilities: laser vision, demon skin, and fire. Mr. Incredible’s looking a bit like Old Man Kratos. Elastigirl’s been given the Inspector Gadget treatment, though I don’t think she likes it much. In Wong’s story, Violet has taken over as the matriarch of the Parr family following the death of their parents (cue sad face). She’s got a facial scar and full-body tattoos—plus, the suit Edna’s made her has seen some better days, meaning she may finally have retired from the hero business. 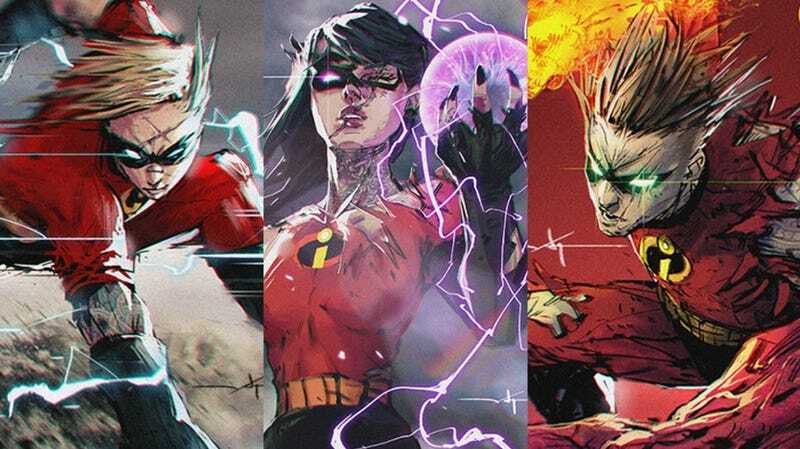 Meanwhile, Wong envisions Dash as a reckless and rebellious teenager, while Jack-Jack explores his powers as a polymorph, figuring out how to control all of his abilities. 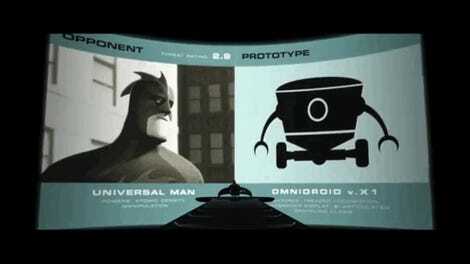 Recently, Wong shared his latest storyline: Old Man Incredible, which appears to take place before the Incredibles kids-grown-up series. It gives Mr. Incredible a bitching beard and puts him on a path of vengeance after Mrs. Incredible was supposedly killed and his children stolen from him. Although, it turns out Elastigirl wasn’t killed—she was kidnapped and experimented on with cyber technology, only to escape and destroy the lab that changed her. They’re also sporting some awesome tattoos—guess we know where Violet and the others got the idea from. In addition to giving The Incredibles the dystopian futuristic saga they deserve, Wong is currently working on the latest chapter of his scifi comic, Zodiac, as well as developing a fantasy storybook dedicated to his daughter. The storybook should be coming out sometime this year. Update: Added Elastigirl image and story.